Cortana, a strong competitor to Apple's Siri and the Google Assistant, has just been updated for beta testers on Android. The update introduces some sleek redesigns of both the look and features of the app, developing anticipation for the official update. MSPoweruser reports today that the improvements include a new card-based interface, a simple yet useful way to view important information for the day ahead. 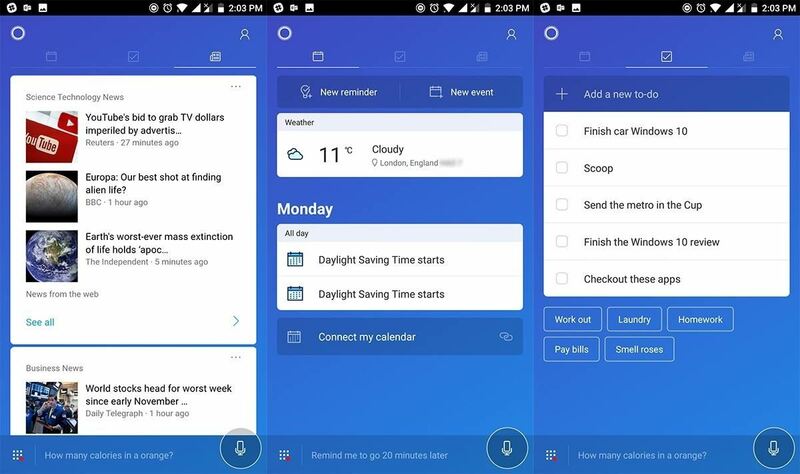 Through the 'My Day' tab in-app, Cortana displays the day's events and schedules—and with this new update, users have the ability to seamlessly create a reminder or event right from the top of the app. All told, this should make viewing and planning your day a breeze. Additional features reported include an improvement on lock screen positioning (a feature introduced early this month), the ability to create reminders and lists from the app's home screen, and improved reminders with location triggering. No more excuses for forgotten shopping items, as Cortana will remind you when you reach your destination. These updates are currently only available to app testers. You can sign up here to experience all the new features. Cortana is available and has been updated today for iOS, however, the update only adds additional color themes and small visual improvements to Cortana's listening mode.